Published: May 12, 2012 5:00 pm Updated: May 12, 2012 5:35 p.m.
SALT LAKE CITY — The Utah Office of Tourism kicked off its spring and summer advertising blitz with a unique ad showing Utah's Delicate Arch in a way it’s never been seen before. It’s in an amazing 3D tunnel display that has the people who see it gawking with their mouths open, staring, pulling out their cellphones and taking photos. It's located at the Montgomery & Market Street BART transit station in the heart of San Francisco's financial district. The 3D mural, about 104 feet long, will stay in place for two months and be seen by thousands of Bay area commuters. "It's the ceiling, the floor, (and) the walls (that have) beams, and all the beams line up and when you stand at the beginning of the tunnel, all the beams line up and it looks like Delicate Arch," Williams said. The tunnel and a video, which can be seen on UOT's YouTube channel, are part of the $2.2 million ad campaign to show off all five of Utah's National Parks. The state is promoting Utah's "Life Elevated" brand in several markets, including Denver, Portland, Phoenix, L.A. and Vegas. “We believe our ‘forced perspective’ installation featuring Utah’s Delicate Arch is the first of its kind in the environmental advertising category,” said Struck executive creative director Steve Driggs. “The creation of the tunnel wrap required us to collaborate with a 3D illustrator who scanned the entire length of the tunnel in all its dimensions. We then needed to plot the scans based on GPS coordinates in a 3D architectural rendering program. In the end, we’ve delivered a unique advertising experience in San Francisco that literally transports viewers to Utah.” The "wow" factor seems to be working. "And then as you walk underneath the beams you're looking up and you feel like you're walking through the arch, it's pretty clever," Williams said. "People were saying, ‘Wow the floor, I almost have to be careful walking along, it looks so real.'" 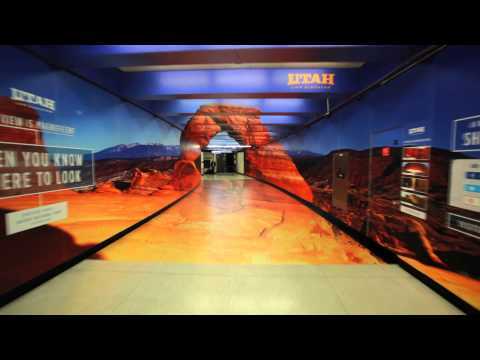 Inside the tunnel, there are images of Utah's other parks, and QR codes that people can click with their cellphone to get more information. Each year, Utah’s tourism industry generates more than $6 billion for the state. In the first three months, visitation to Utah's five national parks was up 14 percent over last year.